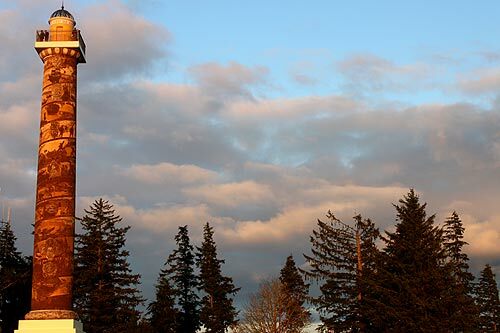 At 125 feet tall, the Astoria Column on the north Oregon coast is a sight to be reckoned with – even more so when you discover that its placement on Coxcomb Hill puts it 600 feet above sea level. Packed full of scenic views, the multitude of steps to the top are, interestingly enough, not the only way to take in wowing scenes. Even just the top of Coxcomb Hill provides one panorama after another, with sights of the bay, the mountains, rivers and the ancient town of Astoria in riveting abundance. The Astoria-Megler Bridge trails off in one direction, while just beyond that you can glimpse the Pacific Ocean. 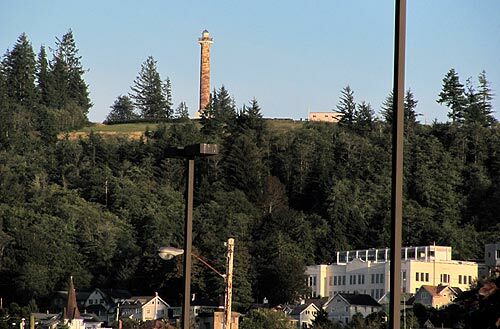 In many ways, the Astoria Column is the centerpiece of this already-mesmerizing town. It commands attention from its perch above town, seen from just about anywhere. 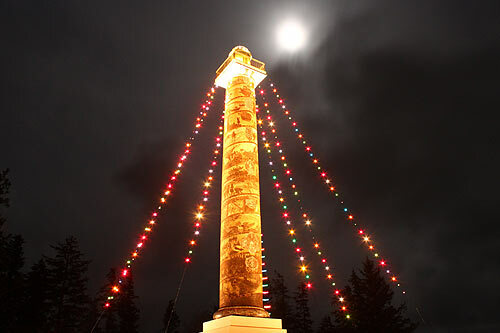 Pictured here is just such a viewpoint, along with a closer look of the Astoria Column and the structure at night, wrapped up in Christmas lights.